When you download Metashape, you may notice the interface theme is grey and contains no color. Use the following steps to change the theme to color display. On the General tab, change the theme from “Light” to “Classic”. You should receive a prompt that the theme will be changed after restarting Metashape. 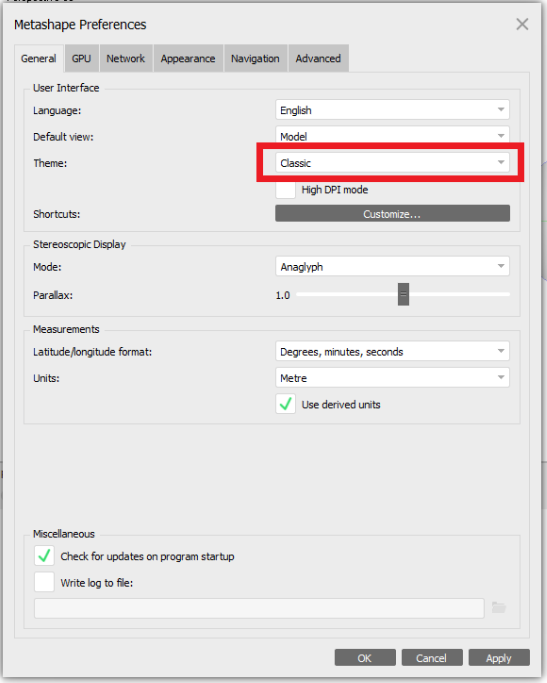 Click Ok.
Click Ok to close the Metashape Preferences dialog. The interface should now be set to the classic theme. This entry was posted in AirGon Tools, Tips and Workflows and tagged color, display, grey, light, metashape, theme.